Sister Adelina was born in Costa-Volpino, Bergamo, Italy on 17 July 1920. She still has one surviving brother and a sister who is 105 years old! On the 9th March 1949, she made her first profession as a SMSM, under the religious name of Sister Marie Marcellina, at ESTRABLIN in France. Towards the end of that year she set sail for Oceania and arrived in the New Hebrides on 26 January, 1950. There she was named to work in the kitchen at the hospital on Santo, where she was to remain for 9 years. It was there that she made final profession on 9th March, 1955. Her next mission was at Lamap, where she started teaching young children. 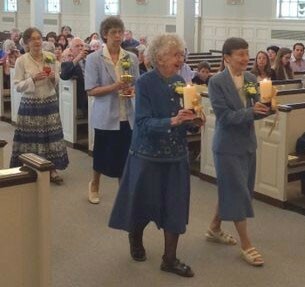 Then it was time for her to go and make her second novitiate. Upon her return she spent time in New Caledonia, and then continued teaching the little ones at St Therese’s in Santo and later in Melsisi. From 1975-1979 she was stationed at Walarano, where she taught domestic science classes. 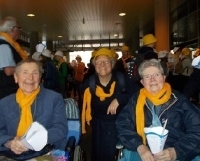 In 1980, she set out for Imaki, Tanna, as one of the founding sisters of our community there. After that she worked in various parts of the archipelago: Vao, Olal, Baie-Barier, Lamap, and Fanafo. In 2006, she was named to the Foyer Nabanga community in Vila, where she used to join the Legion de Mary for their prayer meetings. As her strength and her hearing diminished greatly, she joined Notre Dame community at Paray in 2012. There she continued her life of prayer, as well as helping with minor sewing jobs in the community. She returned to Italy several times during her life for family visits or renewal. A couple of days before her death, she had a fall which resulted in a fractured femur. After spending a day in hospital, Sister returned to the community and very soon afterwards it was obvious that she was dying. 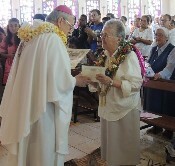 Having received the Sacrament of the Sick and Holy Communion on the morning of January 25 from Fr Benedicta SM, in the presence of the Bishop, Sr Adelina breathed her last at 2-15pm that same day. 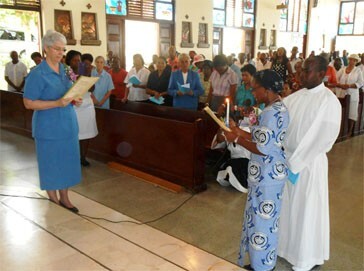 It was Bishop Jean-Bosco Biremes SM, along with several priests, who presided over her funeral Mass in the Paray Parish church, followed by her burial at the cemetery in Montmartre. 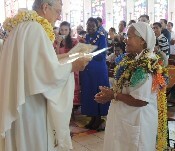 Note well:It was the 26 January 1950 that Sister Adelina, arriving in Port Vila, had first set foot on the soil of the New Hebrides and her body was laid in this same soil on the 26 January 2015. 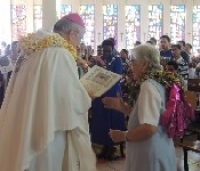 65 years of presence in the New Hebrides, now known as VANUATU: 65 years of fidelity to her religious life and to the various services rendered to the Church and the people of this land. We can truly thank God for that. Yes, thank you Sister Adelina, for the gift of your long life. Continue to pray for this diocese which you loved so much, for our Congregation and for your family. May Mary, whom you loved dearly, take you to her Son.